The UK has become a nation of binge viewers, Ofcom research reveals, with eight in ten adults now watching multiple episodes of their favourite shows in a single sitting. The findings are part of Ofcom’s annual Communications Market Report 2017, which reveals stark differences in how older and younger people watch television. Eight in ten adults in the UK (79%) – or 40 million people – use catch-up technology such as BBC iPlayer, or subscription services such as Netflix, to watch multiple episodes of a series in one sitting, wiping out the wait for next week’s instalment. One third (35%) do so every week, and more than half (55%) do it monthly. Most binge viewers (70%) find this type of viewing relaxing and enjoyable, and for others it’s an opportunity to discuss with friends (24%). But around a third (32%) of adults admit the temptation to watch another episode has cost them sleep and left them feeling tired. Perhaps as a result, more than a third (35%) of binge viewers, and almost half (47%) of young adults aged 16-24 are trying to cut down their viewing in some way. This includes rationing their viewing (19%), finding an alternative hobby (10%), or even cancelling a TV subscription (4%). Binge viewing has such a strong allure that many viewers say they don’t intend to do it, but the pull of the next episode keeps them tuned in. More than seven in ten (74%) say they sometimes watch more than they intend to, while 18% say this always happens. Bingeing is most popular among young people: more than half (53%) of those aged 12-15 enjoy weekly watch-a-thons, compared to just 16% of over-65s. For that older age group, more than half (59%) prefer a traditional release of one episode per week. The trend has been driven, in part, by the availability of faster home internet speeds, a rise in the number of connected TVs, and increased take-up of smartphones and tablets. For many binge viewers, the desire to keep up with programmes is driven by fear of someone spoiling a programme’s ending (25%). This can result in some (16%) feeling under pressure to keep up with the viewing habits of family or friends. And for some, the days of being tied to the TV schedule are fading, as UK viewers take advantage of being able to watch whenever, wherever they like. More than a third of people watch TV on the move – while on holiday (24%), while commuting (16%) or even in the pub (7%). Just over a half of people (51%) watch TV in their bedroom, while others watch in the kitchen (16%), the garden (9%) or the bathroom (9%). For many, watching TV is now a solo activity. Two in five adults say they watch TV alone every day, and almost nine in ten watch programmes alone at least once a week. One third of people say members of their household sit together, in the same room, watching different programmes on separate screens. Despite this, nine in ten people watch live TV every week, and family viewing is still an integral part of family life. 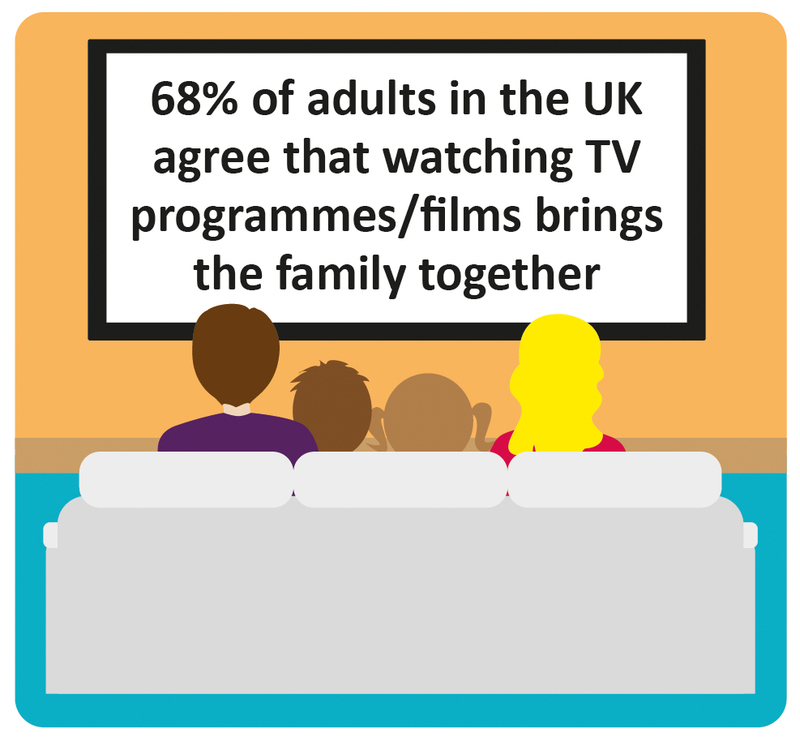 Three in ten (30%) adults say their family still watches the same programmes or films together every day, while 70% do so at least once a week. Nearly seven in ten (68%) say watching TV can bring the whole family together for a shared viewing experience. Ofcom’s research also reveals differences between the viewing habits of older and younger people, with the latter far more likely to take advantage of streaming services such as Amazon Prime. More than seven in ten (76%) young people aged 16-24 use a subscription streaming service, compared to less than two in ten (19%) older people aged 65 and over. However, BBC iPlayer is the most popular on-demand service with 63% of adults saying they use it, followed by ITV Hub at 40% and then YouTube at 38% and Netflix at 31%. The public service broadcasters’ on-demand services, such as All 4 and ITV Hub, are popular with all age groups – 75% of young adults aged 16-24s, and 59% of over-65s, use these services. Meanwhile, nearly six in ten (59%) over-65s prefer a TV series to be released in the traditional manner, week by week, compared to 40% and 36% of young people aged 12-15 and 16-24 respectively. Lindsey Fussell, Consumer Group Director at Ofcom, said: “Technology has revolutionised the way we watch TV. The days of waiting a week for the next episode are largely gone, with people finding it hard to resist watching multiple episodes around the house or on the move. This year’s Communications Market Report also examines our online habits – looking particularly at the sharing of images, and wide differences in people’s approach to online privacy. It reveals that more than half (56%) of parents don’t indulge in ‘sharenting’, the common practice of sharing pictures of children on social media. Among those who do not share, the main reason (87%) is a wish to keep their children’s lives private. 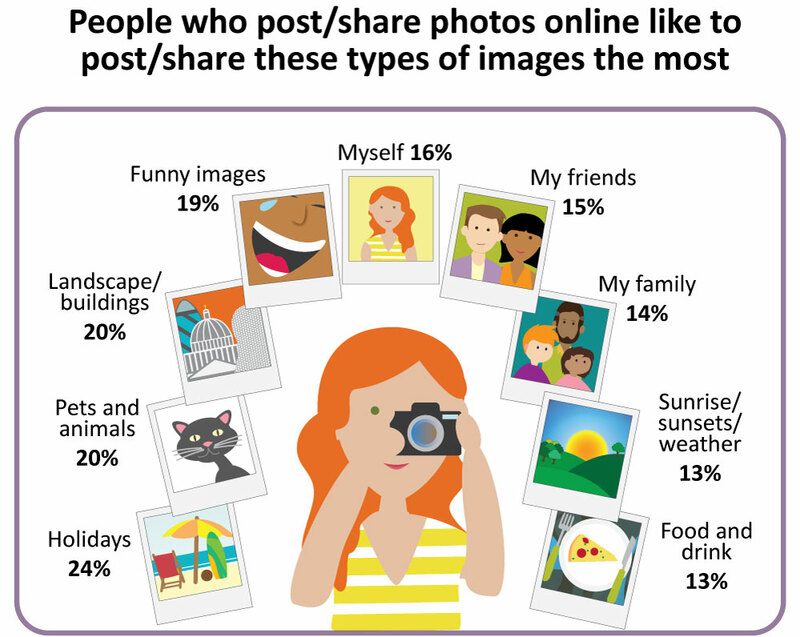 In contrast, 42% of parents do share photos of their children, and half of these share photos at least once a month. Of those parents who do share photos, just over half (52%) say their children are happy for them to do so, and eight in ten (84%) say they only share photos or videos their children would be happy with. A large majority (85%) of these parents say they are careful about who can access the material. Understanding the privacy implications of sharing images is a critical media literacy skill, and some people are aware that, once they post an image, they no longer have control over it. Half of people understand that an uploaded photo is difficult to delete because it may have been shared or saved by someone else, but 17% think it is easy to delete, and a further 16% didn’t know. Older people are far less confident about using privacy settings than younger internet users. The large majority (81%) of 18-24s feel comfortable changing settings, but this falls to 37% of over-55s. Most people are aware of other people’s privacy, with seven in ten (70%) saying they wouldn’t share photos of other people without their permission, and three-quarters saying that personal images should only be shared with friends or followers. And six in ten (62%) people who post photos of themselves (‘selfies’) say they have ‘untagged’ themselves from someone else’s photos or videos of them. Younger people are more relaxed about sharing photos. Almost two in ten (18%) people aged 18-24 don’t mind sharing with everyone, compared to just 5% of people over 35. More than a third (34%) of those aged 18-24 say the pictures they post and share most often are selfies – more so than landscapes/buildings (32%) and holidays (31%). But among the wider population, holidays are still the most popular online snaps (24%). Most selfie-takers (71%) say it’s important to look their best in photos, and nearly half (47%) feel pressure to look good online. This is more common among young people aged 18-24 (77%), and significantly more so among women (82%) than men (58%). Almost three-quarters (74%) are cynical about the photos that other people post. Seven in ten say other people’s photos offer a ‘rose-tinted’ view of that person, or make their life appear more exciting than it is. This view is strikingly high among younger people – 85% of 18-24s, and 88% of 25-34s, agree with it, compared to only 65% of over-55s. Unfortunately, despite knowing that these photos might not be realistic, viewing these photos can have a negative impact. One third (32%) say looking at other people’s photos makes them feel that their life doesn’t match up, rising to more than half (53%) of 18-24s. The Changing TV Landscape research was conducted by Populus, and used findings from 2,356 respondents aged 16+, and 505 interviews with 12-15 year olds. 40 million based on ONS population figures for people over 16 living in the UK, of whom 79% binge watch. In 2016, 44% of homes had speeds of over 30Mbit/s, two-thirds of households had a connected TV, 76% of adults had a smartphone and 58% of adults had a tablet. The base for the 25% figure is among those who binge; the 16% figure is among all adults. 45% say they watch TV alone, every day, 87% watch programmes alone at least once a week, and 92% do it at least monthly. 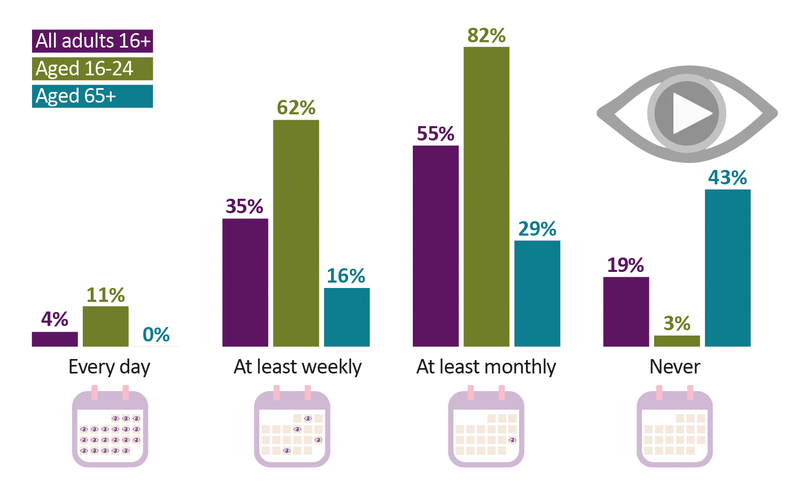 31% people say members of their household sit together on a weekly basis, in the same room, watching different programmes on separate screens, and 36% do so monthly. 6.While 91% of UK adults watched live TV in an average week in 2016, the amount of time UK adults spend watching has fallen since 2010, with a decline in average daily viewing time of 36 minutes to 3 hours 51 minutes per adult (16+) per day in 2016. Including everyone aged four and over, daily viewing is 3 hours 32 minutes. The Power of the Image research draws on findings of an online YouGov survey conducted by 1,000 adults aged 18 and over. It also includes findings from Ofcom’s Adult’s Media Lives video study, which looks at people’s relationships with digital media over a long period of time. Total UK communications revenues generated by telecoms, TV, radio and postal services increased by £0.19bn (0.4%) in real terms to £54.90bn in 2016. Total number of mobile subscriptions continued to rise, reaching 92 million at the end of 2016, and nearly two-thirds of mobile subscriptions were enabled for 4G. Average monthly household spending on communication services has increased slightly in real terms over the past five years from £122.15 in 2011 to £122.54 in 2016. Broadcast TV generated revenues of £13.80bn last year. This was a £0.10bn (1%) rise on 2015 in real terms. The reach of broadcast TV remained high in 2016, with 91% of the TV population (individuals aged four and over) watching TV at least once in a typical week through 2016. However, there’s a widening gap between the viewing activities of the youngest and oldest audiences, with children aged four to -15, and adults 16-24 showing the largest declines in broadcast TV viewing in 2016, compared to a small increase in viewing among the over-65s. Total UK telecoms (landline, fixed internet and mobile voice and data services) revenues grew by 0.4% in real terms in 2016, to £35.60bn. The total number of fixed broadband connections increased by 2.2%, to 25.3 million, while the proportion of these that were superfast increased by six percentage points to 44% of all broadband connections. In 2016, 8% of home connections had an average speed of 100 Mbit/s or higher. Conversely, 29% of home connections had an average download speed of less than 10 Mbit/s, but this is down 10 percentage points since 2015. Total UK radio industry revenues decreased slightly to £1.20bn in 2016, a drop of 0.9%. Nine in ten people (89.6%) in the UK listen to the radio at least once a week, and this has remained steady for the past five years. But, people are listening to the radio for longer: on average, weekly listening increased by six minutes, to 21 hours 24 minutes. Three in ten now use an online music service, while 16% have listened to podcasts. 88% of adults now have internet access at home. Four in ten (42%) internet users regard their smartphones as their most important device for getting online. More than nine in ten 16-24s and 25-34s own a smartphone. Desktop ownership is now 29% across the UK, down by three percentage points since 2016. Addressed letters continued to decline in 2016, and fell 4% in 12 months, to 11.8 billion items. Parcel operators are investing in their operations to allow for rapid tracking of packages, and greater flexibility in delivery options, reflecting the growth in online shopping.